Welcome to the website and project dedicated to reviving awareness and appreciation of Admiral Sir Harry Burrard Neale – a forgotten New Forest naval hero. 2015 will see the 250th anniversary of Sir Harry’s birth and 175th of his death and, in the intervening years – and despite impressive memorials to his achievements – awareness of the man has naturally faded – to the point where he is currently a ‘forgotten hero’. The ‘Burrard Neale 250‘ project is determined to remedy this and give the Admiral the 250th birthday he deserves. This exciting new project aims to resurrect the memory of forgotten New Forest naval hero Admiral Sir Harry Burrard Neale, to mark the 250th anniversary of his birth. Sir Harry had a glittering naval career, rising through the ranks to become a Lord of the Admiralty and subsequently Commander-in-Chief of the Mediterranean Fleet. 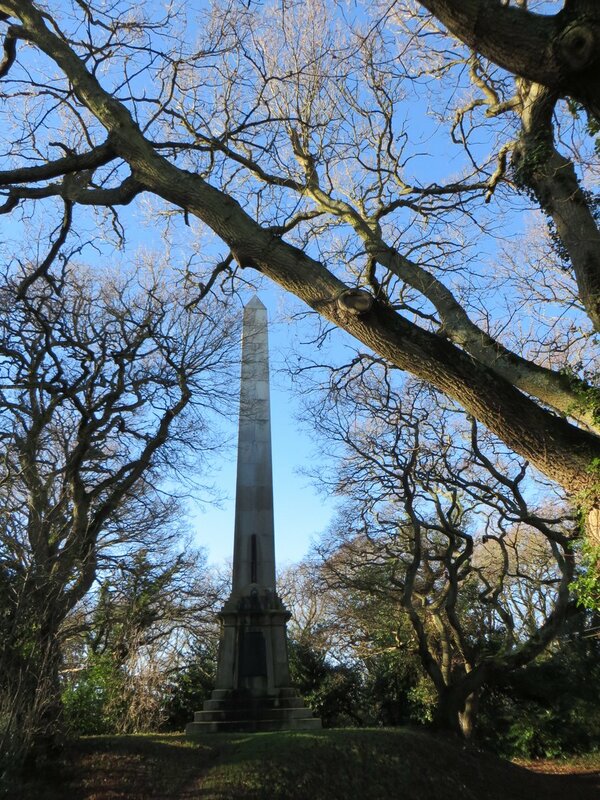 As Mayor and MP for Lymington over many years, he was widely respected and, on his death in 1840, a magnificent obelisk was erected, by public subscription, in his memory. Over time, this Walhampton Monument has become overgrown and largely obscured – as has the memory of Sir Harry. The ‘Burrard Neale 250’ project aims to raise awareness of this forgotten hero and restore his neglected monuments. The project is being led, on behalf of Lymington & Pennington Town Council, by the Lymington Society – the town’s civic society – supported by the Hampshire Gardens Trust. In addition, Hampshire County Council, New Forest District Council, the New Forest National Park Authority, St. Barbe Museum & Art Gallery and St. Thomas’ Church, Lymington are each involved with aspects of ‘Burrard Neale 250’. • Raising awareness of the project – especially through volunteers and communication with New Forest and Solent organisations. • Maintaining the attraction of the Walhampton site, via the on-going attention of ‘Friends of Sir Harry’ volunteers. • Celebrating Sir Harry’s 250th Anniversary – by linking the Admiral with a series of community events, throughout 2015, of attraction to New Forest residents and visitors alike. A copy of our brochure Burrard Neale 250: Awakening memories of a forgotten New Forest naval hero can be downloaded here. A hundred years ago the site was surrounded by cast iron railings with a trident pattern. These survived WW1 but were cut off in 1940 when WW11 started. The concrete base remains and a single piece of the trident pattern as a corner post. There was also a wicket gate. I do hope the railings can be replaced. Dear Hugo. Thank you for sharing your memories of the Monument 75 years ago. From the foundations which lie alongside Monument Lane, one can see where the railings stood and the gap where (the 1900 postcard shows) there was the wicket / kissing gate. Further out, beyond the northern end of the railings (by the ‘Solent Way’ sign-post), remains an isolated foundation of a trident. Have you any idea whether the isolated trident was connected with the railings e.g. by a chain-link fence? The equivalent southern trident is almost certainly the sole survivor – it’s now in safe, private hands and we hope to incorporate it in our restoration scheme. Please does anyone else have pre-WWll recollections of the Monument … or photographs and postcards? Is there any more information about the type and origin of the cannon? Did it survive until the removal of the railings … or did it go somewhere earlier? It would be fascinating to know. Yes Hugo, i remember the gun. It was a shame it was taken away for scrap, we had such fun playing on it when we were young. The corner tridents, one of the tridents broke of at the top and we made up a game, bury the trident in the Monument grounds and we would have a treasure hunt and see if anyone could find it, It may still be there. There were two gates, one at the top and one at the bottom. The gate at the bottom was a massive thing, it was so heavy it had a steel roller at the outer edge running in a steel groove. The year was 1930 onward. We lived next door to the Monument. My father was gardener to Col, Heseltine of Walhampton Cottage. We lived in the cottage behind the Waggon & Horses. The Monument was our happy hunting ground for Bob Figgins and myself.Happy days. Dear William. Many thanks for your recollections of the Monument in the 1930s.. Please can you explain further about the gates? By ‘top gate’, are you referring to the wicket / kissing gate up by Monument Lane … and when you talk of a very heavy one at the bottom, are you referring to Undershore Road – or elsewhere? We’ve certainly not come across signs of a heavy, rolling gate during our recent excavations … but it would have had considerable scrap value. Please can anyone else recall the site years ago? Was it maintained or neglected? Did you use to play there? Isn’t life strange. In researching the history of my new home (Vancouver, Canada) I end up finding my way back to an old one (southern Hampshire). Every day, on my way to work, I walk up Burrard Street, cross the Burrard Bridge, and walk down the hill toward the Burrard Inlet. Wondering who this Burrard was, I did some digging, only to find that (as with so many Canadian place names) its origins can be traced back to British exploration. Although I lived in Southampton for more than 6 years and spent many happy weekends exploring Lymington and the wider New Forest, I can’t say I ever chanced upon the Walhampton Monument, and for that I am sorry. Dear John. Many belated thanks to you for your email – and congratulations for making the Vancouver link with Sir Harry: not many people have been aware of it – but we’re determined to change that! As you say, 3 or more of the principal features of the City of Vancouver are named after Burrard – and it’s ‘our Admiral’ who is being referred to! The funny thing is that, whilst we believe Sir Harry fought in the West Indies and off the eastern seaboard of North America, we don’t believe he got closer than 3,000 miles to Vancouver. The origin of the naming is that Captain George Vancouver ‘discovered’ the area whilst surveying the Pacific Northwest coast of North America for Britain in 1792 – and the Captain made a habit of naming his ‘discoveries’ after his mates! A year or so ago, I was making enquiries of the Mayor of Vancouver’s office [where one of the staff turned out to be from the Isle of Wight!] and made one very exciting discovery of my own – the City of Vancouver holds a telescope that was presented to Admiral Sir Harry by Admiral Nelson in 1805, on the occasion of Sir Harry assuming command of HMS London. [It was presented to the city in 1943 by a Canadian Burrard descendent.] Especially as Lord Nelson died in 1805, this is a real gem! I’d just like to make one request, on behalf of ‘Burrard Neale 250’. Is it correct that the Burrard Bridge carries large figureheads of Admiral Burrard and Captain Vancouver? If so, please can you help us with photos of them? Thank you again, John: it’s fascinating to find that the grandest monuments to Sir Harry are not at his birthplace but 4,700 miles away in Canada! Thank you for helping to build our picture of the Monument and its surroundings. We have a very small print of 1855 that shows a minute park bench to the north of the Monument and are interested in the possibility of introducing a replica of it: please can you recall what it looked like? On the subject of concrete bases, we’ve discovered a very solid block, adjacent to the most prominent electricity pole (see photograph) and would like to learn why its there. It has the unusual dimensions of 88ins / 224cms length x 18ins / 46cms width x 7ins / 18cms depth and carries no signs of any fastenings (e.g. of a seat or cannon). Can anyone offer an explanation? I married into a family who are descended from Harriet, a daughter of the Rev. Sir George Burrard, younger brother of Sir Harry and who succeeded him as 3rd baronet. My late father-in-law had Burrard as a middle name. You might be interested to know there was another Burrard admiral. He was Admiral Sir Charles Burrard, 2nd, and last, Baronet, of Lymington (this was a separate creation and a second Burrard baronetcy and Sir Charles’s father, General Sir Harry Burrard (again) was a first cousin of Admiral Sir Harry Burrard-Neale). In 1863, one of Sir Charles’s six daughters, Emily Burrard, married the future Rear Admiral. Maurice Horatio Nelson, third son of the second Earl Nelson of Trafalgar and of Merton and Baron Nelson of Burnham Thorpe. There are living descendants of that marriage and they still carry forward the name Burrard in the family.